ELCHE, Spain, November 2, 2016 (PLD Space PR) — The European rocket company PLD Space has received an important backup from the European Space Agency (ESA), with the award of the Future Launchers Preparatory Programme (FLPP) project called Liquid Propulsion Stage Recovery (LPSR). This contract will enable PLD Space to investigate and develop the most promising technologies and launch operations to make the reusability in the European launchers sector a reality, as well as to accelerate PLD Space´s ARION 1 and ARION 2 micro-launcher programs. The LPSR project is part of ESA´S Future Launchers Preparatory Programme (FLPP), which aims to prepare the next generation of European launchers fostering the study of liquid propulsion reusable stages. In addition, the LPSR Project will promote new Project Management strategies, reducing costs and development risks while keeping industry competitiveness. LPSR, backed by the European Space Agency (ESA) with $833.000, will set the principles and demonstrate the needed technologies and procedures with real hardware, with the main goal of evolving the current market of European expendable launchers into affordable reusable launchers. The project is divided into three phases: 1) Definition of liquid propulsion-based stage recovery concepts, 2) analysis and definition of technology developments and operations for safety reentry and landing and, 3) ground and flight testing campaigns including an air-drop test of full-scale ARION 1 propulsive stage demonstrator. The ultimate goal of the LPSR project will be recovering for the first time ever in Europe, a liquid-fueled booster stage, the first stage of an orbital micro-class launcher, that will be later re-launched again. LPSR project accomplishments and developments will also promote the direct implementation of reusability technologies to other European launchers, being all this know-how directly applied to the orbital Small Satellites reusable launcher – ARION 2. 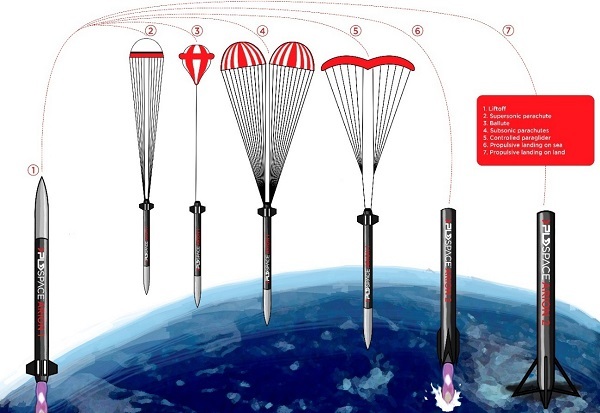 PLD Space studies indicates that due to the small size of ARION 2, the launcher will not be able to land only by using propulsive landing, since the extra propellant will impact dramatically in the orbital payload mass. PLD Space is considering the use of air-braking systems during the supersonic exo-atmospheric flight and supersonic reentry. The inaugural flight for ARION 2 is scheduled in June 2020. In fact, PLD Space is working at full steam ahead to make the European Small Satellites market accessible and flexible for the first time. To accomplish that, and prior to this maiden flight, PLD Space will test, with several flights, all launcher critical technologies (propulsion, structure, avionics and recovery system) in the suborbital micro-launcher, known as ARION 1, where the outputs of the FLPP – LPSR project will have their highly relevant contribution. PLD Space ambition is to launch ARION 1 by the end of 2018 as Europe´s first liquid-fueled reusable launcher. Meanwhile at PLD Space’s headquarters in Elche, engineers are working in the three major subsystems (propulsion, structures and avionics) of the ARION 1 micro-launcher to meet its first maiden flight by the end of 2018. In addition, propulsion engineers are upgrading the current propulsion test stand, called VTS-1 to perform long-duration engine firings, allowing to test the new liquid propulsion system up to 180 seconds, a full-mission firing for the ARION 1 single stage rocket. PLD Space is pleased to acknowledge ESA and the FLPP board for putting their faith in us. So the weight of three types of parachute and a ballute plus their packing/release systems would not? Maybe I’m misunderstanding the graphic. If you can demonstrate existing capabilities to make these things work. At even suborbital low altitudes. Many have tried and failed – look at Armadillo Sarge flights for example. The same question popped up in my mind when I read that paragraph. Maybe they’ll just test the different variants to use either supersonic parachute OR ballute combined with subsonic parachutes OR a paraglider. But that would still be to complete systems. vs “only” the extra fuel for controlled landing. I think the other systems are different options “being studied.” They are pretty early in the study so they probably haven’t come close to deciding on an architecture. My impression: The graphic shows the project steps, with increasing complexity. That is a very good development. I wish LPSR the best. According to all existing evidence and historical data, it takes a team of at least a hundred people and over five years, at a minimum. Don’t forget lots and lots of government money too! Eh, isn’t it a simple question of mathematics & physics? When you scale say 2:1, the mass of a 3D object grows as a power of 3, but the area of the parachute only by a factor of two. Hence, I guess it is far easier to provide a parachute for a small rocket than for a heavy rocket. This is also a reason why e.g. living organisms have limits, larger animals are different than smaller or building big buildings is that more difficult.